An 82-year-old man with a right arm primary melanoma excised 18 months previously (Breslow thickness 3.5 mm, no ulceration; stage T3a), with negative sentinel lymph node biopsy (TNM stage IIA). The patient was referred to the Melanoma Clinic because of a bulky tumor on the right axilla confirmed by a Tru-Cut biopsy as a melanoma lymph node metastasis. A PET-CT revealed numerous tumoral nodules on the right axilla sized between 10 mm and 40 mm and standardized uptake values up to 11.7. 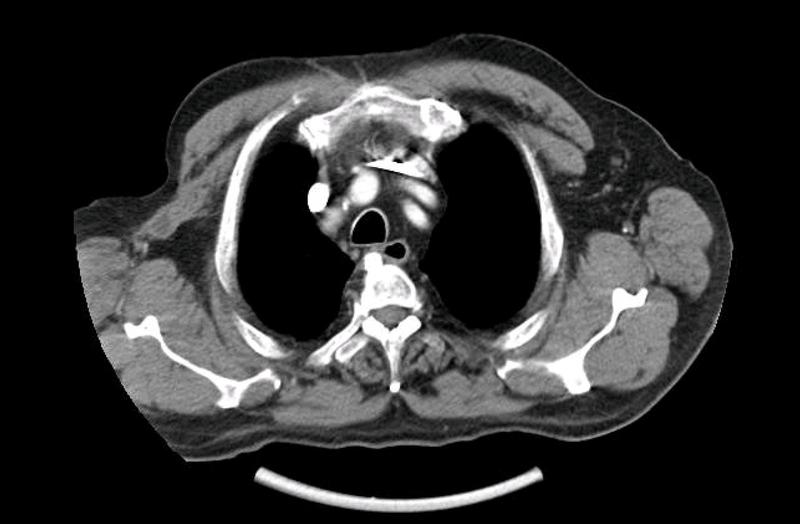 The regional CT depicted a bulky tumor involving the whole right axillar space with retropectoral and infraclavicular extension (Figure 1). The PET-CT and brain magnetic resonance imaging confirmed no evidence of disease elsewhere. The patient had a good overall condition, with ECOG-PS 0, and Karnofsky 100%. After the Melanoma Committee discussing the resectability of the tumor, the patient was offered lymph node dissection. 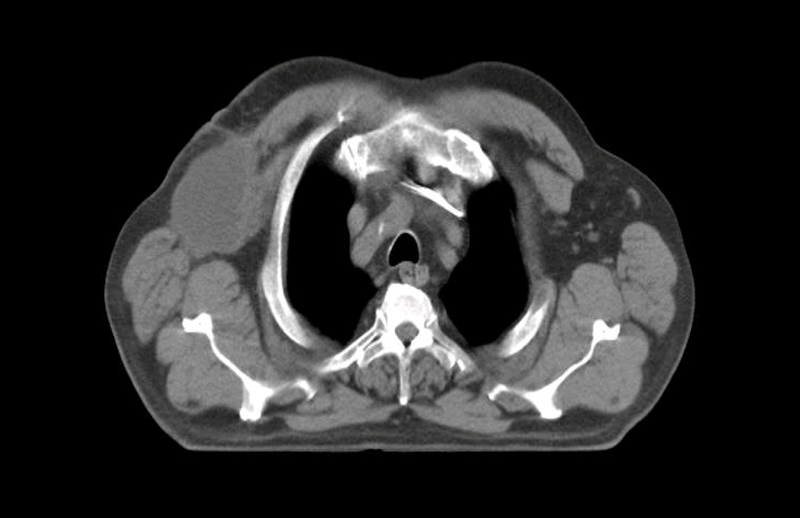 A metastasectomy was performed, including dissection of level I-III axillar lymph nodes. 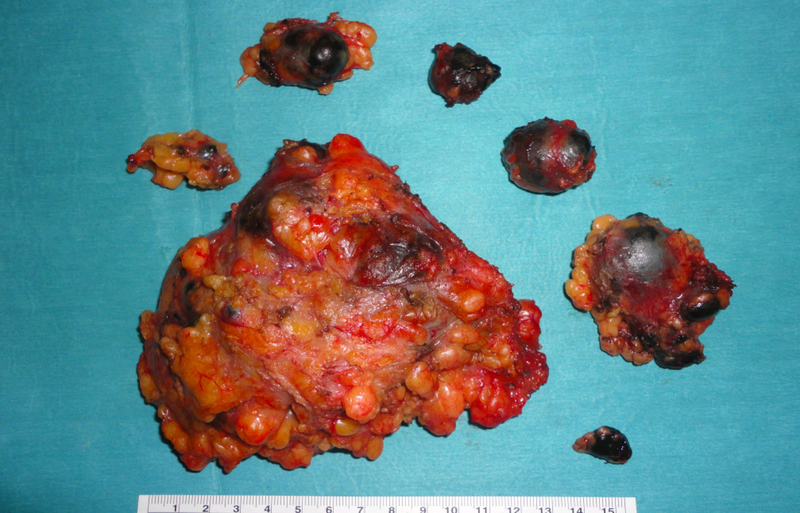 A 13x11-cm matted tumor and 6 black enlarged lymph nodes were removed (Figure 2). A complete resection surgery could not be ensured due to the large tumoral burden (Figure 3). The final pathology report confirmed metastases in the 16 lymph nodes removed. The patient received postsurgical tridimensional photon radiotherapy (30 Gy, with 5 Gy fractions, twice a week) with no complications. Three years after lymph node dissection and radiotherapy, the patient is alive, with no physical limitation, no lymphedema, and with a 12-mm nonprogressive nodule on the right axilla consistent with postsurgical changes, as observed in the follow-up imaging (Figure 4). In the current therapeutic landscape, therapeutic lymph node dissection is capable of providing survival rates not attained by other nonsurgical therapies1. Even for those borderline indications of surgery (i.e., bulky tumor, elderly patient), as with the patient described, lymph node dissection offers an outstanding chance to provide appropriate regional control and long survival. 1. National Comprehensive Cancer Network clinical practice guidelines in oncology. Melanoma version 1.2017. November 2016. https://www.nccn.org/professionals/physician_gls/PDF/melanoma.pdf.